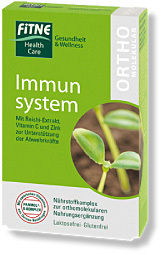 Fitne Nutrient Complex Immune System - 60 pcs. This well balanced supply of vitamins, minerals and trace elements contributes to the maintenance of the body’s defenses. Folic acid and vitamins B6, B12, A, C, D3 and E are particularly important for the immune system. The trace elements zinc, selenium and copper play an important role in cell protection. Reishi can support the body’s own defense. FITNE Nutrient Complex Immune System provides you with important nutrients for the preservation of the body’s own defense. Ingredients: PANMOL®-B-KOMPLEX (natural vitamins from sprouting quinoa), capsuleshell: hydroxypropyl methylcellulose, sodium ascorbate, maltodextrin, niacin, reishiextract (2.9%), d-alpha tocopheryl acetate, calcium pantothenate, manganesegluconate, zinc citrate, citrus extract, vegetable oil, pyridoxine hydrochloride, thiamine hydrochloride, natural beta carotene, riboflavin, copper (II) gluconate, carrier substance: gum arabic, sucrose, folic acid, corn starch, chromium(III) chloride hexahydrate, biotin, sodium molybdate, sodiumselenate, phytomenadione, cholecalciferol , cyanocobalamin. Based on organically grown quinoa. Fitne ACE + Selenium + Zinc Black Cumin Oil Capsules - 60 pcs.